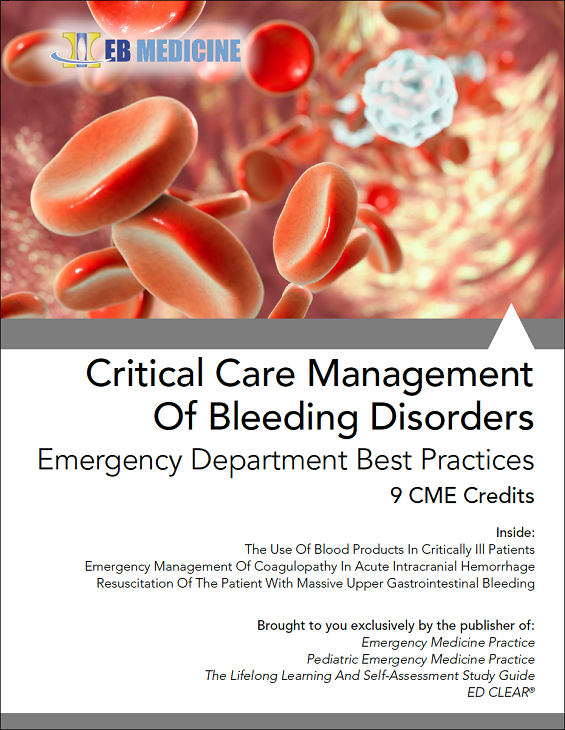 This compilation of issues, originally published in EM Critical Care, represents a valuable collection of research and analysis on blood products and the management of bleeding disorders. They are written specifically for emergency clinicians who manage critically ill patients within their emergency departments. Since publication of these 3 important EM Critical Care articles, there have been several important updates in the arenas of blood product transfusion in the critically ill. The issues have been reviewed, and important new research and literature have been summarized here in a special update section. Day 1 or Day 42: Does the age of blood products matter? Proper Use of Blood Products: It is imperative that emergency physicians have a basic understanding of blood products and the indications and risks associated with their use. Evidence-based, restricted use of blood components in critically ill patients can lead to decreased mortality while avoiding unnecessary morbidity and complications. Recognition of the need for irradiated or leukoreduced components in special populations further reduces adverse events. This issue reviews the preparation of blood components and indications for their use, infusion of products, and the determination of stability after infusion. Management Of Coagulopathy In Patients With Acute Intracranial Hemorrhage: In the setting of an acute intracranial hemorrhage, very small amounts of additional bleeding may result in catastrophic consequences to the patient. When a coagulopathic patient with an intracranial hemorrhage presents to the emergency department, rapid reversal of coagulopathy is the most urgent medical intervention. Treatment of coagulopathy is necessary both to prevent hematoma expansion and facilitate neurosurgical interventions. This article reviews existing data and recommendations and suggests an approach to managing coagulopathy in patients with various forms of acute intracranial bleeding. Resuscitation Of The Patient With Massive Upper Gastrointestinal Bleeding: Managing an unstable patient with massive gastrointestinal bleeding can be challenging, but effective management can optimize patient outcomes. Knowledge of the emergency procedures and medications available, as well as familiarity with the treatment modalities used by consultants, will help the emergency physician orchestrate the care necessary to ensure patient survival. Helpful when giving massive transfusions with plasma. Will keep this in my desk for reference! LOVE how your authors highlight the strengths and include brief summaries attached to the extensive references. Great article, as I had to consent a ruptured ectopic pregnancy case for PRBC transfusion and used the knowledge gained from this article to assist with the process.